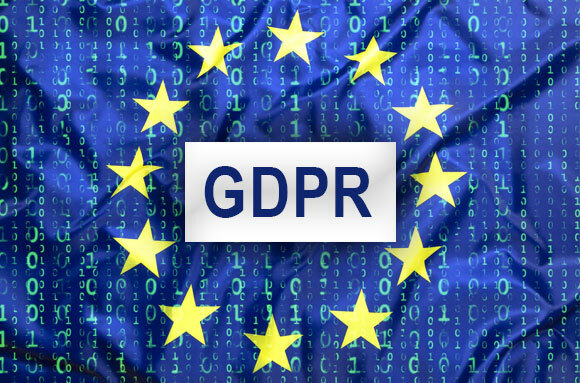 GDPR, or General Data Protection Regulation, is a new set of European rules and standards related to privacy and data governance. It is for both European companies and any company doing business in Europe or with European customers. The regulation requires the active consent of customers and gives them new portability powers to control the transfer of their own information — and sets up significant penalties for non-compliance. GDPR starts May 25, 2018. Compliance will not be optional. Unlike the previous EU Directive on data privacy, GDPR is an EU Regulation. Unlike a Directive, national governments do not need to pass enabling legislation. GDPR is effectively a European law. It overrides the national laws and all previous EU directives. The penalties for non-compliance are significant. Fines can be imposed up to 20m € or 4% of the total worldwide annual turnover of the preceding financial year, whichever is higher. Valid consent must be explicit for data collected and the purposes data is used for. In addition, you must be able to prove “consent” (opt-in) and consent may be withdrawn. The old escape clauses for non-European companies no longer work. Non-European companies utilized “Safe Harbor” provisions to comply with the original data protection regulation, but this was overturned in 2015 by the European Court of Justice. 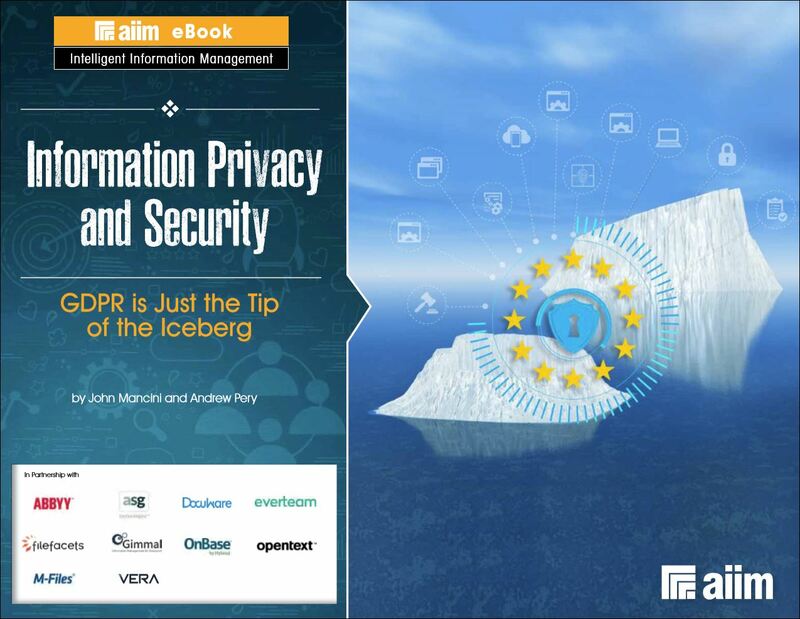 Managing unstructured information and documents are key to compliance. The EC defines personal data as any information relating to an individual, whether private or professional. Name, address, photo, email address, bank details, posts on social networking websites, medical information, or IP addresses are all valid. GDPR applies to the processing of personal data wholly or partly by automated means. It also applies to the processing other than by automated means which form part of a filing system. In other words: paper documents. If personal identifiable information is being stored or handled by a cloud services provider or a document process outsourcer on your behalf, you retain responsibility for the data governance practices of your outsourcers. There is no one single technology that meets all GDPR requirements. An organization must adopt a holistic information management strategy. Document management and workflow automation can play a key role. 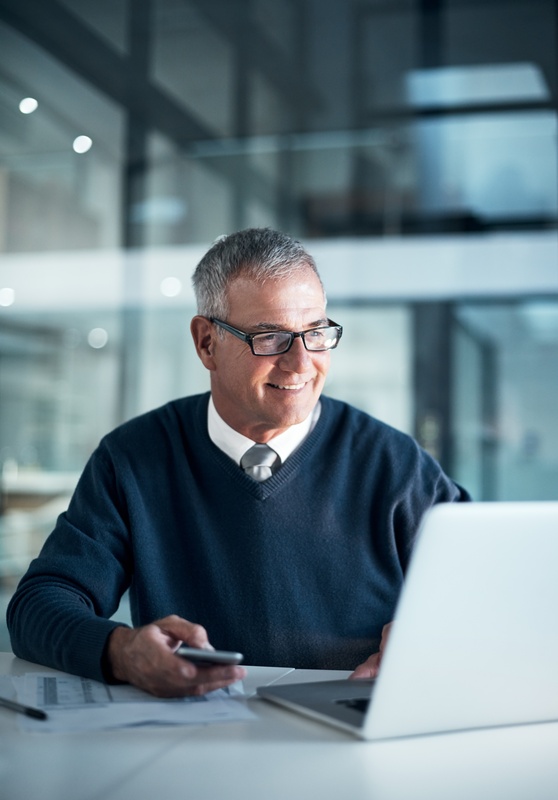 DocuWare offers both a document management and a workflow automation system that helps you comply in all of your document-based processes. Providers of document management solutions — such as DocuWare — help ensure compliance with GDPR. Email, contracts and other documents that contain personally identifiable information are considered personal data and must be archived, managed, protected and controlled. Discover how DocuWare helps. 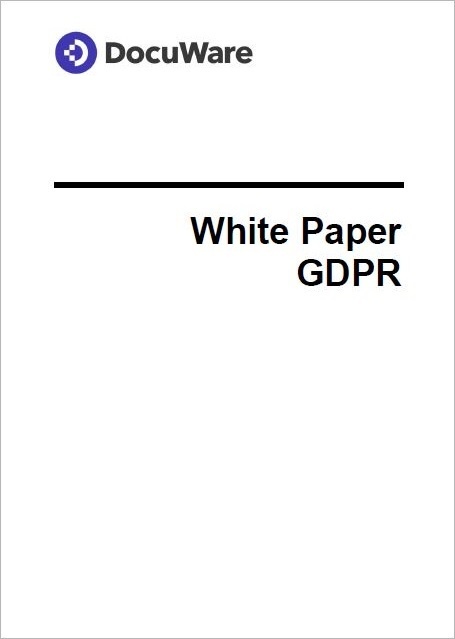 Download the free GDPR White Paper. 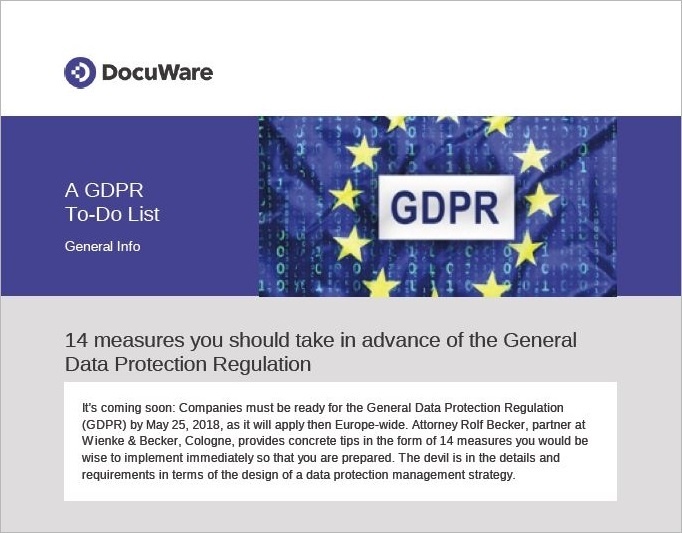 DocuWare has collaborated with attorney Rolf Becker, partner with the law firm of WIENKE & BECKER, Cologne, to provide you with 14 concrete and practical tips to help you prepare for the General Data Protection Regulation and General Data Protection Regulation (GDPR). This includes the identification of areas relevant to data protection, the creation of processing directories, surveillance plans, and GDPR-compliant certifications. How has data protection and security changed over the years? What is the GDPR? Who does it impact? What do these regulations mean for companies? How should your organization respond and what role will machine learning play in solving problems? In many ways the EU is leading the way toward a fundamental overhaul of privacy protection that brings it in line with the realities of digital commerce. Resistance may be both futile and counterproductive to the promotion and growth of digital commerce. Please find here the English version of GDPR with contents and a handy quick search. On the official website of the European Union you can find the language versions for all EU member states for download. The European Commission published an FAQ entitled Rules for business and organisations. Looking for document management tools to manage personal data? Schedule a demo to learn how DocuWare can help your GDPR compliance strategy.